Support for the ASPEN Community is at an All Time High! The ASPEN Community is proud to announce that Ikegami, a manufacturer of professional and broadcast television equipment, has joined the ASPEN Community. The ASPEN Community is a rapidly growing coalition of more than 30 industry leading manufacturers and end users who are adopting the ASPEN framework for building state-of-the-art IP facilities. ASPEN (Adaptive Sample Picture Encapsulation) is a standards-based, open format that moves uncompressed Ultra HD, 3G, HD, and SD signals over MPEG-2 transport streams (ISO/IEC 13818-1). ASPEN provides a framework for transporting separated video, audio, and metadata as independent IP multicast streams. The ASPEN Community was founded at IBC 2015 to realize and promote the benefits of deploying the ASPEN format within IP-based broadcast and media facilities through the integration and interoperability of the open format. "Ikegami is proud to join the ASPEN Community and very eager to create a next generation broadcast eco-system with a belief that interoperability and open standards will ultimately benefit customers. As IP based solutions will play a key role, Ikegami recognizes a real potential in ASPEN. We see joining the ASPEN Community as truly beneficial because of the great enthusiam by Evertz and the other members of ASPEN Community. Ikegami is also ready to contribute to move this exciting technlogy forward," says Naoki Kashimura, Director of the Board, Global Business Promotion. "We are thrilled to welcome Ikegami to the ASPEN Community. Ikegami brings over 50 years of experience in professional and broadcast television equipment to the ASPEN Community. Their expertise in broadcast cameras, monitors and switchers will help to further develop the ASPEN technology," says Mo Goyal, co-chairperson of the ASPEN Community. The ASPEN Community announces that ASPEN has achieved a significant milestone as it has been published by Society of Motion Picture and Television Engineers® (SMPTE®), a leader in motion-imaging standards and education for the communications, media, entertainment, and technology industries. Adaptive Sample Picture Encapsulation (ASPEN), which was submitted to SMPTE as a Registered Disclosure Document (RDD 37) is now published in the SMPTE digital library. ASPEN is an open framework that enables independent flows for video, audio, and metadata in an IP-based broadcast and media facility. ASPEN expands on the MPEG-2 Transport Stream (IEC 13818-1 or ITU-T Rec. H.222.0) standard to include uncompressed UHD/3G/HD/SD video over TS. The ASPEN framework also utilizes open standards for transporting audio (SMPTE ST 302) and metadata (SMPTE ST 2038). SMPTE 2022-2 is used to encapsulate the transport streams into IP. "The ASPEN framework takes advantage of IP to allow for independent video, audio, and metadata flows while utilizing the proven MPEG-2 Transport Stream architecture to enable facilities to move to IP today," said Mo Goyal, co-chair of ASPEN Community. "The publication of the RDD-37 also enables the ASPEN Community to promote interoperability, and encourages others to participate, to provide the industry a comprehensive open format solution." "As the number of global installations continues to grow, achieving this milestone is very exciting. The publication of the SMPTE RDD-37 reinforces our commitment to supporting open-formats in the IP transition. Driven by business and competitive decisions, a great many of the leading media companies in the world have already installed and launched services utilizing our IP-based systems. Our customers cannot stall or pause in their competitive environment; they need to execute quickly and carefully. ASPEN is the open framework that enabled that to happen. The fact that it is not only an open format but a published format within SMPTE, is great news to all of the current users and the industry at large!" said Romolo Magarelli, CEO of Evertz. "Ross will be showing ASPEN I/O on our Acuity Production Switcher Series at NAB 2016, demonstrating the ability to plug and play in the Evertz ASPEN routing environments that mutual customers, of Ross and Evertz, have deployed," said David Ross. "Opening up ASPEN as a published set of specifications that anyone can adopt is an important step in closing the gap between the promise of IP and the practicality of today's easy SDI connectivity." "The ASPEN initiative is very dynamic and has started to be well-spread in the TV broadcast community," says Christian Dutilleux, CEO of DELTACAST. "We will be proud to provide our customers with easy access to ASPEN devices through our products." Broadcast Pix is in the process of adding the ASPEN protocol for IP video to their Granite integrated live production switcher. Broadcast Pix is also exploring the addition of support for ASPEN across their entire product line, along with other IP protocols. "We like the ASPEN protocol for its separation of video, audio, and ancillary data. This ability to separate streams is important to us for the professional post production environment. The efficient transport of the video essence that ASPEN provides allows for more signals through an IP network than other competing uncompressed standards. The format agnostic nature of ASPEN will also help us in our transition to 4K and beyond workflows," says Benjamin Taylor, CTO, Broadcast Pix, Inc. The benefits of ASPEN and the importance of this milestone are echoed throughout the ASPEN Community. "Pixel Power customers will be very pleased to see our IP playout demonstrations at NAB," said Nick Wright, CTO Pixel Power, "and now that we have reached a key turning point with the ASPEN open standard being published by SMPTE as RDD 37 it enables continued trust as we deliver our virtualized software solutions." "We are happy to be participating in the ASPEN interoperability demonstration at NAB with our new Hybrid IP/SDI media analysis platform: PRISM Here, we will be showcasing our upcoming software option to support RDD 37 flows within PRISM With ASPEN being based on the proven legacy of transport streams, the integration of the capability into our new product was straightforward and well supported," says Charlie Dunn, GM, Video Product Line, Tektronix. "The transition to IP infrastructures in the television production environment is inevitable and is a change that will accelerate exponentially in the next decade. Hitachi has been at the forefront of large-scale computing networks and cloud technology catering to Fortune 500 companies worldwide. Our networking, data management, and storage technologies are world-renowned. Aligning ourselves with ASPEN allows us to efficiently transport high-quality, uncompressed video over modern data networks. With ASPEN; our HDTV and UHD cameras become ubiquitous within the modern IP production plant. The full integration of ASPEN in our TV Production camera offerings will elevate our customer's R.O.I. in HITACHI products as well as adding a new, much more efficient operation and reliability performance," remarks, Masahiko Kato, Corporate Officer and GM, Video & Communications Systems Division. "Vizrt is really enjoying seeing early customers adopting ASPEN; to be able to be an early player on video playout and graphics shows the real value for our customers adopting ASPEN in quite large numbers. Being able to exploit the flexibility of the new IP infrastructure - and at this early stage is really encouraging both for us and our customers," says Petter Ole Jakobsen, CTO Vizrt. The ASPEN Community is proud to announce NewTek, makers of the world's most complete multi-camera video production systems and a leader in IP video tools, has joined the ASPEN Community. The ASPEN Community is a rapidly growing coalition of more than 30 industry leading manufacturers and end users who are adopting the ASPEN framework for building state of the art IP facilities. NewTek develops easy-to-use and cost-effective technology for broadcast television and video production. From production switchers, IP solutions which aide in live production and streaming, slow motion and instant replay tools, to Skype video calling systems, motion graphics, virtual sets and visual effects, NewTek has tools for all the production environment needs. "NewTek is very excited to be joining ASPEN. We believe that IP-based video workflows are one of the most fundamental changes to the way broadcast video is produced," said Dr. Andrew Cross, president and CTO for NewTek. "The promise of this technology is that anyone, anywhere can collaborate and work with video on a single network. By working together and allowing collaboration between NDI and ASPEN technologies, we are truly transforming the industry. Enabling the smallest independent web-casters right up to the highest-end broadcast facilities with products from hundreds of vendors and 100,000's of customers already enabled represents the true promise and future of broadcast IP." "We are excited to welcome NewTek to the ASPEN Community. As developers of groundbreaking video production technology, leveraging both software and hardware, NewTek is dedicated to providing users the tools to bring their ideas to life. NewTek brings with them a decade of IP experience, from the development of their TriCaster multi-camera video production systems and the groundbreaking Network Device Interface (NDI), which will help to further develop and promote ASPEN," says Mo Goyal, co-chairperson of the ASPEN Community. The ASPEN Community is proud to announce TVU Networks, a pioneer in IP-based live video solutions, has joined the ASPEN Community. The ASPEN Community is a rapidly growing coalition of more than 30 industry leading manufacturers and end users who are adopting the ASPEN framework for building state of the art IP facilities. TVU Networks designs and develops technology for IP-based live video solutions for newsgathering organizations and other independent video producers. TVU's solutions help transform broadcasters' SDI-based operations - which include acquisition, transmission, production, distribution and management - to an IP-based infrastructure. "We have been a big believer in the advantages and benefits of IP based infrastructure for broadcast from the beginning. We introduced our TVU Grid video switching, routing and distribution solution a few years ago in response to the industry's inevitable movement from SDI to IP, and we continue to develop IP based technology products and services for the industry," said Matt McEwen, VP of Product Management, TVU Networks. "We are honored to join the ASPEN community in support of IP-based workflows and standardized interoperability between devices." "We are excited to welcome TVU to the ASPEN Community. TVU brings a strong background in IP-based live video playout to the ASPEN Community. Globally recognized by major newsgathering organizations, TVU has integrated their live video playout expertise into the IP-based workflow and helped organizations transition to IP while leveraging their existing workflow infrastructure. This expertise will help to further develop the ASPEN technology," says Mo Goyal, co-chairperson of the ASPEN Community. The ASPEN Community is proud to welcome its newest member, TV 2, the largest commercial television station in Norway. The ASPEN Community is a rapidly growing coalition of more than 30 industry leading manufacturers and end users who are adopting the ASPEN framework for building state of the art IP facilities. TV 2 supports all work for open standards in the industry. "We are excited to welcome TV 2 (Norway) to the ASPEN Community. As the leading broadcaster in Norway, TV 2 brings over three decades of broadcast experience and knowledge to the Community. TV 2 has recently deployed ASPEN to become the first international playout facility using 10GbE. This accomplishment highlights the readiness of ASPEN for facilities today," says Mo Goyal, co-chairperson of the ASPEN Community. The ASPEN Community is proud to announce that Pixel Power, a designer and developer of broadcast automation, playout and graphics technology solutions, has joined the ASPEN Community. The ASPEN Community is a rapidly growing coalition of more than 30 industry leading manufacturers and end users who are adopting the ASPEN framework for building state of the art IP facilities. Pixel Power develops, distributes and supports technologies and workflows that media companies rely on to create their on-air identity, enhance their content with stunning graphics, as well as deliver their services. From smartphones and PCs, to TVs and massive stadium displays, Pixel Power's efficient and effective solutions ensure maximum impact both on audiences and the bottom line. "We are delighted to be part of the ASPEN Community at this critical stage in the rollout of IP technology in broadcasting," said Nick Wright, CTO, Pixel Power. "For quite some time, we have been working with broadcasters to aid their transition to IP and virtualized platforms. It was a logical step to join ASPEN as an effective community, working together in a collaborative environment to benefit our industry." "We are excited to welcome Pixel Power to the ASPEN Community. Pixel Power brings a unique background in graphics production and integrated playout technology to the ASPEN Community. As an international automation, branding and graphics innovator, Pixel Power has successfully integrated their graphics excellence into an environment of software workflows and virtualized environments. This expertise will help to further develop the ASPEN technology," says Mo Goyal, co-chairperson of the ASPEN Community. The ASPEN Community is proud to announce that Broadcast Pix, a leader in integrated production switchers, has joined the community. The ASPEN Community is a rapidly growing coalition of more than 30 industry leading manufacturers and end users who are adopting the ASPEN framework for building state of the art IP facilities. ASPEN (Adaptive Sample Picture Encapsulation) the ASPEN protocol is a standards-based, open format that moves uncompressed Ultra HD, 3G, HD, and SD signals over MPEG-2 transport streams (ISO/IEC 13818-1). ASPEN provides a framework for transporting separated video, audio, and metadata as independent IP multicast streams. The ASPEN Community was founded at IBC 2015 to realize and promote the benefits of deploying the ASPEN format within IP-based broadcast and media facilities through the integration and interoperability of the open format. "MPEG-2 is widely deployed throughout the industry. ASPEN leverages that proven technology to deliver a flexible transport format for high-quality video with very low latency," said Kevin Prince, president and CEO of Broadcast Pix. "We are proud to be part of this effort to support the industry's continued transition to IP-based production environments." "We are very pleased to welcome Broadcast Pix as the latest member of the ASPEN Community. As leading manufacturers of production switchers, Broadcast Pix brings valuable knowledge and expertise of the live production environment to the ASPEN Community," says Mo Goyal, co-chairperson of the ASPEN Community. The ASPEN Community is proud to announce that PHABRIX, an innovative leader in test and measurement instruments, has joined the community. The ASPEN Community is a rapidly growing coalition of industry leading manufacturers and end users who are adopting the ASPEN framework for building state of the art IP facilities. ASPEN (Adaptive Sample Picture ENcapsulation) is an open format that was developed to meet the real world requirements of an IP-centric facility while leveraging proven MPEG2-TS standards. ASPEN provides a framework for transporting separated video, audio, and metadata as independent IP multicast streams. The ASPEN Community was founded at IBC 2015 to realize and promote the benefits of deploying the ASPEN format within IP-based broadcast and media facilities through the integration and interoperability of the open format. "PHABRIX are delighted to join the ASPEN community. Our latest instrument for T&M, the PHABRIX Qx is a true hybrid solution targeted at both SDI and IP network based applications. This exciting new platform has been developed with the flexibility to support new open formats and ASPEN is recognized as one of the leading standards available," says Paul Nicholls Marketing director PHABRIX. "With their experience in test and measurement in the broadcast industry, PHABRIX brings a unique perspective to the ASPEN Community. As the industry continues to transition from SDI to IP, the ASPEN Community is committed to providing the leadership to educate the industry on the benefits of ASPEN as an open framework for IP facilities," says Mo Goyal, co-chairperson of the ASPEN Community. As we enter 2016, support for the ASPEN Community is at an all time high. Since its inception at IBC 2015, the ASPEN Community has seen its membership grow to over 30 major leading broadcasters, media companies, and equipment manufacturers. With over 20 global installations, ASPEN is the only field proven, open framework for IP-facilities available today. The ASPEN Community was formed to provide information exchange between end- users and manufacturers who use ASPEN as an open architecture based on proven industry standards to facilitate the transition from SDI to IP. ASPEN (Adaptive Sample Picture Encapsulation) is an open format that enables independent video, audio, and metadata flows for IP-based broadcast and media facilities. ASPEN (SMPTE RDD 37) expands on the MPEG-2 Transport Stream (IEC 13818-1 or ITU-T Rec. H.222.0) standard to include uncompressed UHD/3G/HD/SD video over TS. The ASPEN framework also utilizes standards for transporting audio (SMPTE ST 302) and metadata (SMPTE ST 2038). SMPTE 2022-2 is used to encapsulate the transport streams into IP. Through the collaborative efforts of its experienced and knowledgeable members from all aspects of the broadcast workflow, the ASPEN Community is dedicated to providing a comprehensive end-to-end IP solution. The ASPEN Community members include: Abekas, AJA Video Systems, ChryonHego, Cinegy, Coherent Video Systems LLC, CSP Inc., Deltacast, Diversified Systems, Discovery Communications, Dome Productions, Edit Share, Embrionix, Evertz, FOR-A, Game Creek Video, Hitachi Kokusai Electric Limited Inc., I-MOVIX, LEADER Electronics Corp., Macnica America Inc., Matrox Electronic Systems Ltd., NEP Group Inc., Neutrik, PacketStorm, Phabrix, Providius Corp, Ross Video, Sony, Tektronix, Time Warner Cable SportsNet, and Vizrt. The ASPEN Community is proud to welcome AJA Video Systems as the newest member of the community. The ASPEN Community is a rapidly growing coalition of industry leading manufacturers and end users who are adopting the ASPEN framework for building state of the art IP facilities. "As the broadcast industry moves towards an IP based infrastructure, it's becoming increasingly more important for technology developers to adopt open format standards that will make this transition easier for everyone in the industry," said Nick Rashby, President, AJA Video Systems. "We're happy to join the ASPEN community and further our commitment to supporting IP-based workflows." "We are very pleased to have AJA Video Systems join the ASPEN Community. The transition from SDI to IP is a major initiative in the industry, and the ASPEN Community is providing the leadership for an open framework for building IP facilities. AJA Video Systems has extensive experience in the video and media broadcasting industry which will be invaluable to help media and broadcasting professionals make the transition to IP using ASPEN," says Mo Goyal, co- chairperson of the ASPEN Community. Evertz Microsystems, a leading company in IP innovation, announces a complete IP production deployment for NBC Sports in collaboration with Sony, at this year's Sports Video Group (SVG) Annual Summit in New York City. The IP production solution is based on ASPEN, a framework that provides separated video, audio, and metadata IP flows for NBC Sports' HD production starting in February 2016. Building the IP facility based on ASPEN gives NBC Sports greater flexibility and cost savings over an SDI replacement using SMPTE 2022-6. ASPEN allows for video, audio, and metadata to be on individual IP multicast streams. This flexibility gives NBC Sports complete control over sending specific video and audio signals to particular destinations without the need for costly external embedding and de-embedding devices. ASPEN also maximizes bandwidth utilization on the 10GbE interfaces to ensure NBC Sports is getting maximum throughput and efficiency in its IP core matrix. The core of the facility is Evertz' Software Defined Video Networking (SDVN) solution which includes their EXE40-VSR, a 46Tb/s high capacity switch, 570IPG high density media gateways, and 3067VIP10G 10GbE multiviewers, all under Evertz MAGNUM SDVN Orchestration and Control. Evertz SDVN gives NBC Sports the flexibility to scale their facility to meet current and future needs. "The collaboration with Sony for this NBC project is significant news for the industry as we move to IP-based production," said Eric Fankhauser, Vice President of Product Development at Evertz. "The use of ASPEN for individual multicast flows gives NBC Sports enormous flexibility in their production workflow. It allows NBC Sports to transition to IP with confidence that they are using a best of breed solution from two industry leaders." Another core component of this IP production solution is IP-enabled products from Sony. Sony, a leading supplier of AV/IT solutions has been developing IP live production solution and its system cameras and production switchers that will be inter-operable in ASPEN workflow. "Our collaboration with Evertz in IP-based workflow will satisfy the needs of media and entertainment industry customers," said Junichi Ogikubo, General Manager of Sony's Professional Solutions Group. "IP-based technologies are playing a significant role in live production and distribution and play-out, as the broadcast and production industries move to end-to-end IP-based networked workflows." Tim Canary, VP of Engineering at the NBC Sports Group headquarters in Stamford, CT, commented, "We're pleased to see the interoperability and joint effort between Evertz and Sony. We are designing our control room based on various rapidly emerging IP standards from Evertz, Sony and others. Our expectation is that the vendors will quickly engage with each other to achieve cross vendor compatibility, and at the same time, allow for all of the increased functionality that IP Video and Audio routing offer." NBC Sports, Evertz, and Sony are members of the rapidly expanding ASPEN Community (www.aspen-community.com) which provides an open framework for building flexible, scalable, and highly efficient IP facilities. ASPEN (Adaptive Sample Picture ENcapsulation) is an open framework that should allow users to build adaptable, scalable and more efficient IP facilities. It allows video, audio and metadata to be carried on individual IP multicast streams to provide greater flexibility for transport, production, and playout. It is built on existing MPEG2-TS standards, and is claimed to offer a robust format for encapsulating uncompressed Ultra HD, 3G, HD or SD (and other future formats) over MPEG-2 transport streams, with very little latency. Since its introduction by Evertz at NAB this year, it has garnered considerable support, and the new ASPEN Community, announced at IBC, already has numerous members, including manufacturers, broadcasters and outside broadcast companies. The ASPEN Community is proud to announce that FOR-A Company Ltd. has the newest member of the community at InterBEE 2015. The ASPEN Community is a rapidly growing coalition of industry leading manufacturers and end users who are adopting the ASPEN framework for building state of the art IP facilities. The development of ASPEN; a framework that provides separated video, audio, and metadata on individual IP multicast streams; has been a collaborative effort between many broadcast industry leaders. The ASPEN Community was founded at IBC 2015 to realize and promote the benefits of deploying the ASPEN format within IP-based broadcast and media facilities through the integration and interoperability of the open format. We are very pleased to have FOR-A as the latest member of the ASPEN Community. With transition from SDI to IP as a major initiative in the industry, the ASPEN Community is providing the leadership for a common open framework for building IP facilities. FOR-A provides valuable experience in the production aspect of the broadcast chain that will help with the transition to IP," says Mo Goyal, co-chairperson of the ASPEN Community. At CCW 2015, the ASPEN Community is proud to announce that I-MOVIX, a leader in extreme slow motion for broadcast, has joined the ASPEN Community. The ASPEN Community is comprised of industry leading manufacturers and end users who are implementing the ASPEN framework to build IP-centric facilities. "We are very proud to join the ASPEN Community bringing broadcast industry leaders and end users together with the common objective of developing cutting-edge IP-based solutions. This is a challenging opportunity that we would certainly not like to miss", says Laurent Renard, I-MOVIX's CEO and Founder. "We are extremely excited to have I-MOVIX as a member of the ASPEN Community. With transition from SDI to IP as a major initiative in the industry, the ASPEN Community is providing the leadership for a common open framework for building IP facilities. The addition of I-MOVIX brings an experienced voice to the Community," says Mo Goyal, co-chairperson of the ASPEN Community. The ASPEN Community is proud to announce that Matrox Video is the newest member of the rapidly grown ASPEN Community. The ASPEN Community is a coalition of industry leading manufacturers and end users who are adopting the ASPEN framework for building state of the art IP facilities. "As a leading supplier of board-level technology and comprehensive SDKs to broadcast equipment manufacturers, Matrox is committed to providing the fundamental components needed for the SDI-to-IP transition," said Alberto Cieri, senior director of sales and marketing, Matrox Video. "Our OEMs will soon be able to capitalize on the advantages of ASPEN as they create next- generation broadcast graphics systems, capture/playout servers and channel- in-a-box systems for IP-based facilities." "We are thrilled to welcome Matrox Video into the ASPEN Community. Matrox Video is the first board-level supplier joining the ASPEN Community. With this addition, we can assist other manufacturers to launch products that support ASPEN," says Mo Goyal, co-chairperson of the ASPEN Community. Evertz Technologies Ltd today announced the launch of the new ASPEN Community website at www.aspen-community.com. The ASPEN Community was developed in response to the strong interest and support of the ASPEN framework for IP networks. ASPEN, Adaptive Sample Picture ENcapsulation, has been developed as an open framework to build flexible, scalable, and highly efficient IP facilities. ASPEN allows for video, audio and metadata to be on individual IP multicast streams to provide broadcasters complete flexibility for transport, production, and playout applications. 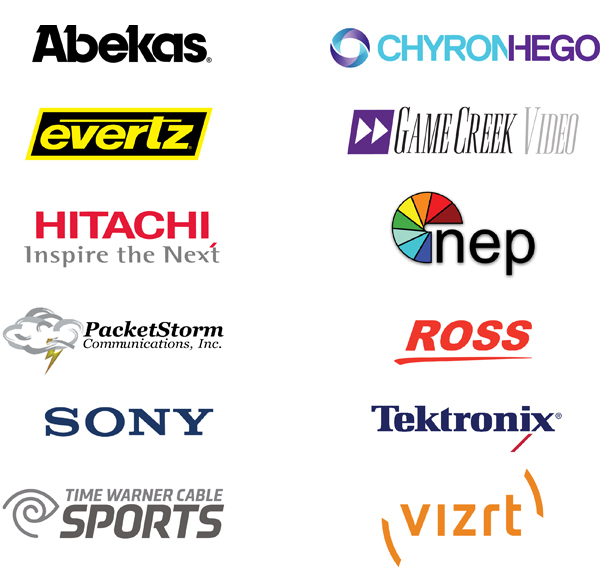 The ASPEN Community, announced at IBC 2015, has been rapidly growing from its initial members who included Abekas, ChryonHego, Discovery Communications, Game Creek Video, Hitachi Kokusai Electric Limited Inc., NEP Group Inc., PacketStorm, Ross Video, Sony, Tektronix, Time Warner Cable SportsNet, and Vizrt. With the strong industry interest regarding ASPEN, the ASPEN Community website will act as a portal of information. The website will keep the industry updated on the progress of ASPEN development and deployment. The ASPEN Community is proud to announce that Macnica Americas, Inc. has become a member of the community. The ASPEN Community is a rapidly growing coalition of industry leading manufacturers and end users who are adopting the ASPEN framework for building state of the art IP facilities. "By leveraging the mature and proven Transport Stream protocol, ASPEN provides a reliable and quick to market framework for transporting uncompressed media streams over IP Networks. Macnica Americas is very pleased to be a part of the ASPEN Community and looks forward to enabling Broadcast IP facilities with this technology," says Marc Levy, Macnica Americas CTO. "We are extremely excited to have Macnica Americas as a member of the ASPEN Community. With transition from SDI to IP as a major initiative in the industry, the ASPEN Community is providing the leadership for a common open framework for building IP facilities. The addition of Macnica Americas brings an experienced voice to the Community," says Mo Goyal, co-chairperson of the ASPEN Community. Evertz, a leader in IP infrastructure solutions for the Broadcast industry, announces a rapid increase in deployments and growing support for the ASPEN protocol. Since its first release at NAB 2015, many leading broadcasters and equipment manufacturers are realizing the benefits of the ASPEN protocol for their leading edge IP facilities and products. ASPEN has been submitted to SMPTE for publication as a Registered Disclosure Document (RDD 37) for the benefit of the broadcast and media industry. Evertz has been leading the IP revolution with global deployments of its Software Defined Video Networking (SDVN) solutions and ASPEN was developed to further support the industry's transition to IP. The development of ASPEN has been a collaborative effort of Evertz and many broadcast industry leaders. These broadcast leaders include: Abekas, ChryonHego, Discovery Communications, Game Creek Video, Hitachi Kokusai Electric Limited Inc., NEP Group Inc., PacketStorm, Ross Video, Sony, Tektronix, Time Warner Cable SportsNet, and Vizrt. Developed to meet the real world requirements of an IP-centric facility while leveraging proven MPEG2-TS standards, ASPEN offers a robust format for encapsulating uncompressed Ultra HD/3G/HD/SD over MPEG-2 transport streams (TS). When combined with existing SMPTE standards such as SMPTE ST 302 (audio over TS), SMPTE ST 2038 (ancillary data over TS) and the SMPTE 2022 family of IP standards, ASPEN provides broadcasters with a flexible method of transporting video, audio, and data over scalable IP networks. Ultra low latency with independent video, audio and ancillary data flows also makes ASPEN ideal for use in production environments and work flows. For NAB 2015, Evertz will demonstrate ASPEN, a robust transport format for uncompressed video on its 570IPG Media IP Gateway module. ASPEN allows for video, audio and ancillary data to be transported individually within and between facilities. ASPEN has been developed in conjunction with leading global broadcasters, to address the needs of IP transport within a broadcast facility for live production and to other facilities. ASPEN is a key format within Evertz' Software Defined Video Networking (SDVN) solution. ASPEN offers end users the full benefit and flexibility of IP, with a simple, scalable method of converting from/to JPEG2000 and uncompressed video over IP. By using ASPEN, the globally deployed Evertz SDVN solution provides a complete set of formats required for facility, WAN, and hybrid facility over WAN applications. Evertz is collaborating with other vendors for a successful deployment of ASPEN. At NAB 2015, Evertz will be demonstrating PacketStorm Communications' Capture & Replay System to capture ASPEN streams for analysis and quality assurance. Also part of the demonstration will be the 570IPG which encapsulates 18 uncompressed 3G/HD/SD-SDI video signals over IP (using 10GbE) using the ASPEN format. The modular 570IPG allows for the highest density of uncompressed 3G/HD/SD-SDI encapsulations in a 3RU . The 570IPG also offers ultra low latency encapsulation (port to port), which enables it to be used for live production environments where high video quality and latency are concerns.